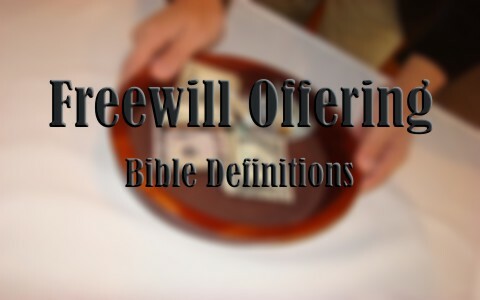 What Does A Freewill Offering Mean? What does it mean to give a freewill offering in the Bible? Is that something we can do in our day too? Freewill is the freedom to choose one thing over another or to do something or nothing. Even making no choice becomes a choice…all because of freewill. Jesus said “For God so loved the world, that he gave his only Son, that whoever believes in him should not perish but have eternal life” (John 3:16) so the “whoever” indicates that whoever chooses to believe in Jesus will be saved, although that is not from us. Jesus said that “No one can come to me unless the Father who sent me draws him. And I will raise him up on the last day” (John 6:44) and God’s children were not born “of blood nor of the will of the flesh nor of the will of man, but of God” (John 1:13), so does man have freewill or was he predestined to be saved (Eph 1)? The answer is yes…but how they work together, I cannot hope to explain. I don’t know how to exactly explain how a car works but that doesn’t mean I’m walking to work. We have choices to make, that much we know. In ancient Israel, they were commanded to give certain prescribed offerings but there was one exception. They were free to give God a freewill offering and there was no set amount on the value. So, what does a freewill offering look like? Does this have any application for us today? In the Law of God, sometimes referred to as the Law of Moses, there were various offerings that must be given and these came at different times of the year, but there was one offering that was set for a designated time but also there was no set amount of the value that was given by God for what they were to offer. Exodus 35:29 says “All the men and women, the people of Israel, whose heart moved them to bring anything for the work that the Lord had commanded by Moses to be done brought it as a freewill offering to the Lord.” As it says, whoever’s “heart” is “moved” can bring anything they want before the Lord, specifically “for the work that the Lord had commanded Moses.” The nation of Israel were obviously behind this work of God and most thought little of themselves and gave generously, so when we think more of God than our own personal needs, God will bless those who make such a pleasing sacrifice to Him, because it is “a pleasing aroma to the Lord” (Num 15:3) out of a generous spirit and with no other motives. Sometimes the freewill offering is referred to as the “peace offering” as it was recorded in Leviticus 22:21, where it says, “And when anyone offers a sacrifice of peace offerings to the Lord to fulfill a vow or as a freewill offering from the herd or from the flock, to be accepted it must be perfect; there shall be no blemish in it.” When Israel gave their “freewill offering or at your appointed feasts, to make a pleasing aroma to the Lord” (Num 15:3) we can read that it pleases God because it’s freely given, without obligation, so to give something voluntarily, we are (likely) doing so out of a pure motive…to please God and help His work. When Moses began the construction of the Tabernacle, people flooded Moses with their freewill offerings (Ex 35:29); so much so that in one case, Moses had to tell the people, it was enough (Ex 36:5)! This is not nearly as remarkable as the Son of God, Who voluntarily died to save us and so “how much more will the blood of Christ, who through the eternal Spirit offered himself without blemish to God, purify our conscience from dead works to serve the living God” (Heb 9:14). Since Jesus’ death on the cross, the sacrificial system is unnecessary but we can still sacrifice to God but not animals, grain, or wine. We can offer God the sacrifice of prayer…but also, as the Psalmist wrote, “With a freewill offering I will sacrifice to you; I will give thanks to your name, O Lord, for it is good” (Psalm 54:6), and he prays to God, “Accept my freewill offerings of praise, O Lord, and teach me your rules” (Psalm 119:108). Let us praise Jesus and “Through him then let us continually offer up a sacrifice of praise to God, that is, the fruit of lips that acknowledge his name” (Heb 13:15), so praise is also a freewill offering so “Offer to God a sacrifice of thanksgiving” (Psalm 50:14), freely and with joy, for we already know, God loves a cheerful giver (2nd Cor 9:7). The greatest freewill offering ever made and will ever be made was from God the Father Who freely gave His One and only Son, Jesus Christ, and Jesus Christ was in agreement, as They always are. He voluntarily gave His life so that we who have trusted in Him might be saved. Jesus said, “No one takes it from me, but I lay it down of my own accord. I have authority to lay it down, and I have authority to take it up again. This charge I have received from my Father” (John 10:18) because “The good shepherd lays down His life for the sheep” (John 10:11) and again, He says that “just as the Father knows me and I know the Father; and I lay down my life for the sheep” (John 10:15). If you reject Him, then you’ll pay for your own sins (Rev 20:12-15; 21:8), and since it’s a debt that can never be paid (Rom 6:23), you will be there for all time. Please; I ask you to consider trusting in Christ today because He gave His life so that you too might be saved. Read more about offerings here: What is The Peace or Fellowship Offering?